Friendly fire; a concept I first properly encountered while playing Ghost Recon games on my original Xbox and Xbox 360. The amount of times I'd accidentally shoot a squad mate in the back as they got between me and my intended target, I quite honestly lost count. 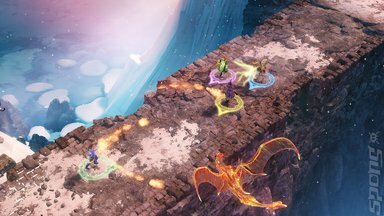 So when I saw how a bunch of apprentice wizards would be doing the same thing in Frozenbyte's latest offering, Nine Parchments at PAX West 2017 I was initially quite shocked to see it. After playing it, however, I could see where they were going with this. Set in the Trine universe, up to four players take on the roles of apprentice wizards who are bored of the drudgery of trying to learn by rote ancient texts that they could barely fathom. They decide to venture out into the larger world to find the fabled Nine Parchments. Sadly things don't go so well for them as they are confronted with a vast array of beasts that try to put an end to their spell-casting ways. Ostensibly Nine Parchments is an isometric co-op adventure in a similar vein to Diablo III, only the major difference is the ability to drop in and out of a game as well as inflict friendly fire on your fellow adventuring wizards. Area of effect spells are great at taking out groups of enemies, just make sure none of your co-op partners are caught up amongst them otherwise they'll get fried too! I had a great time playing Nine Parchments with three other people on the Switch port of the game on the PAX West 2017 show floor. It was fun trying to dodge the attacks of both the enemies and my fellow players as we ploughed our way through the level. There are some elemental aspects of the spell casting that I got a hint of while playing Nine Parchments. The player characters are able to cast spells from different elements and enemies were susceptible to differing forms of magic depending on what element school it comes from. This adds a level of complexity to what would have been a rather mundane dungeon crawler. With Frozenbyte having made the excellent Trine games the visual quality on display within Nine Parchments comes as little surprise. 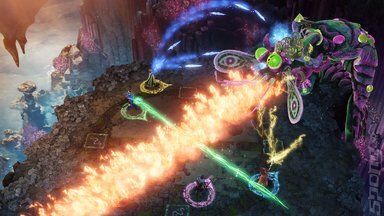 The overall presentation is really excellent, even at this early state of its development so I have no fears over how Nine Parchments will look and sound like upon its release early next year. 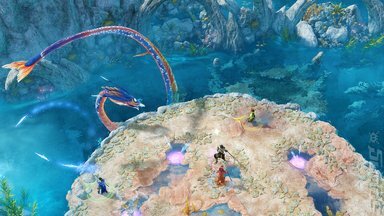 Nine Parchments is out now on Windows PC, Mac, PS4, Xbox One and Switch.